Best Cakes in the South! We make cakes the old fashioned way…like grandma used to. Don’t fight the cravings. Pick up a Dean’s cake from you local grocery store today! 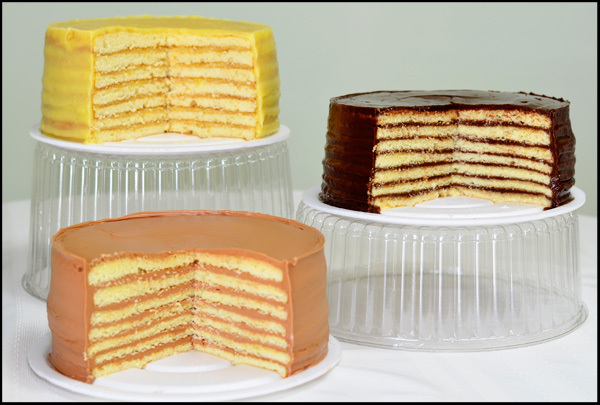 Our most popular seven layer cakes include chocolate, lemon, and caramel. You’ll love our two layer cakes which include red velvet, German chocolate and Italian cream. We can make specialty cakes for weddings, birthdays, and other special events. We also carry flavors of cookies, pies, fudge, brownies and so much more. At Dean’s Cake House you won’t find any assembly line machines. Every cake is baked and iced individually in her cake house located in Andalusia, Alabama. Dean’s Cakes can be found in your local grocery stores, convenience stores, and produce stands. Check out our famous cakes! From 7 layer chocolate to red velvet and butternut…we’ve got the cure for your cravings.